The Pioneer, LIU Post’s university mascot for many years, is approaching retirement. With the Oct. 3, 2018 announcement that the LIU athletic teams from Post and Brooklyn would merge, many changes are coming, including a new mascot. 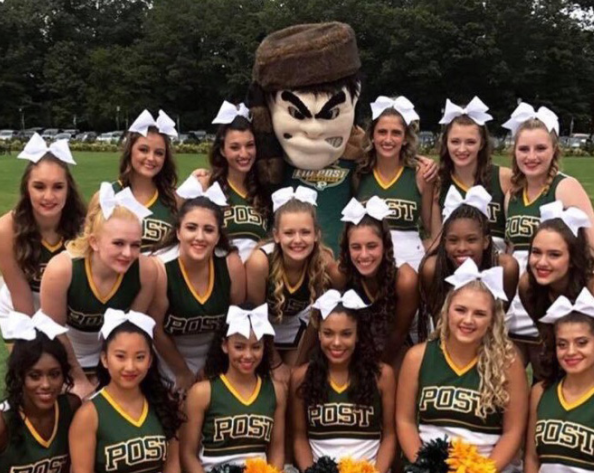 The prior mascot with the cheer team. The campus already changed its colors from green and gold to blue and gold during the fall semester 2018. The new mascot, though, had not yet been chosen when the fall semester ended. “I think we want to make sure that we respect both campuses and start to listen to some of our students about what they will get excited about as a mascot and get that integrated in. I’m not sure as to if we have a time frame to finalize this or not,” DeJong said. Yet, she said that the choice of the new mascot will be solely based on what students are excited to see, not what administrators would like.